When a person has multiple sclerosis (MS), their immune system causes inflammation that affects parts of the central nervous system, including the brain. This can result in a variety of symptoms, ranging from fatigue and pain to loss of cognition and even paralysis. We can’t currently cure MS, just slow it down — but a specific type of cell originating from the gut could change that. 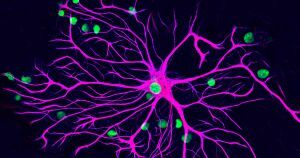 Based on previous studies, researchers already knew that certain plasma cells, also known as B cells, that produce the antibody Immunoglobulin A (IgA) can reduce inflammation in the brains of MS sufferers during flare-ups. In a paper published on Thursday in the journal Cell, a team from the University of Toronto and the University of California San Francisco describes the discovery that these cells migrate to the brain from the intestines. “Showing that IgA-producing B cells can travel from the gut to the brain opens a new page in the book of neuroinflammatory diseases and could be the first step towards producing novel treatments to modulate or stop MS and related neurological disorders,” co-author Sergio Baranzini said in a news release. When the researchers increased the number of IgA-producing plasma cells that migrated from the guts of mice to the animals’ brains, they found they were able to completely eradicate brain inflammation. They believe that increasing the number of these cells in the guts of people with MS might also increase the number that make their way to the patients’ brains. They’re also interested in studying what sorts of gut microbes naturally encourage the creation of IgA-producing plasma cells.